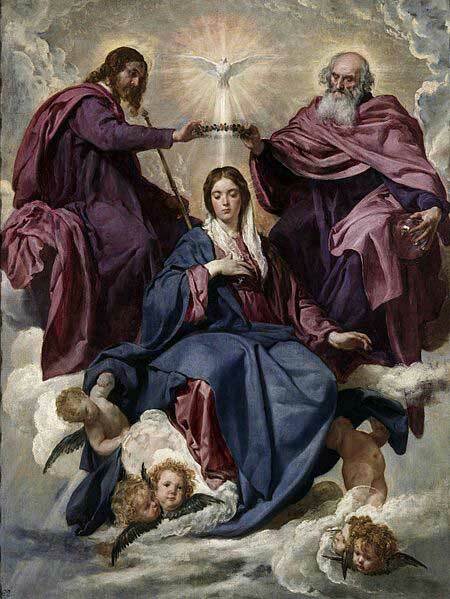 This prayer before Confession for Heavenly aid seeks the help of the Triune God and our Blessed Mother (pictured above in this famous painting of the Coronation by Diego Velazquez), each with distinct petitions. While it is a good idea to appeal to any one of the three Persons of God or Mary for assistance in trying to be righteous, this prayer storms heaven for divine graces and help when it is needed most, in cleansing our souls of sins! Father in heaven, most merciful God, relying on Your goodness and mercy, I come to You with childlike confidence to confess my sins and to beg Your forgiveness. You will not reject a contrite and humble heart. Bless me and receive me again into Your favor. I realize that I have been most ungrateful to You, but I desire henceforth to keep your commandments and to do Your Will in all things. Jesus my Savior, my Good Shepherd, I did not follow in your footsteps but have strayed far from the path that You have marked out for me. Repentant and sorrowful, I beg to be admitted again into the fold of Your faithful followers. I want to confess my sins with the same sincerity as I should wish to confess at the moment of my death. My Jesus, I beg You for the grace to examine my conscience well. Holy Spirit, come into my soul. Enlighten my mind and strengthen my will that I may know my sins, humbly confess them, and sincerely amend my life. Mary, my Mother, Immaculate Spouse of the Holy Spirit, refuge of sinners, help me by your kind prayers. Amen. The line about not rejecting a humble and contrite heart echoes Psalm 51:19 most resoundingly. Moving on to the reference to Jesus as the Good Shepherd, He spoke of Himself this way in John’s Gospel (10:1-18, 27-30) (We read of this image in Psalm 23 as well.) He even mentions there the fold. Yet, if we indeed are like sheep who have gone astray, to use the Prophet Isaiah’s image (Is 53:6) what’s saddest is how easy we fall prey to the wolves around us. Sin can be very alluring, after all! The devil seeks to trap us in webs of deceit, lust, greed, envy, hatred, and all those other vices that can be so appealing to us and yet are spiritually toxic. While a real sheep might run away from a wolf, many of us spiritual sheep wish to run with one, thinking mistakenly that we’ll never get devoured in the process. After all, the wolf has a cool shiny coat! How many people get caught up in the snares of adulterous affairs; gambling, alcohol, and drug addictions; and fits of jealousy and rage against others, just to name a few major sins? Yet it is so easy to stray from the path our Lord has marked out for us. It might seem very appealing and satisfying at first. But when vices become habits, they can fester like cancerous tumors on our souls, and bring us needless misery. Without having the humility to appeal to God for help in breaking free from these traps and getting the graces to resist them further, we jeopardize our souls and run the grave risk of forfeiting our places in heaven, trading eternal splendor there for eternal misery in Hell! The good news, however, is that our Lord wishes to welcome us back to the fold, with open arms, in Confession! He advised St. Faustina once to “tell sinful souls not to be afraid to approach Me; speak to them of My great mercy.” With a good examination of conscience such as this one here, we can approach our Lord in Confession without trepidation. It’s no wonder that the Holy Spirit comes into play in this prayer above right after the mention of such an exam. As the third person of the trinity He can give you the clarity to see your sins as they are, not to brood over them or suppress them with a guilty conscience, but rather to expose and expunge them as fully as you can. With an enlightened mind and a strengthened will, avoiding sins, especially those that have become nasty habits, becomes easier, as does amending your life. And keep in mind after confession that you can keep praying to God in three persons, or to any one of them, Father, Son, and Holy Spirit as often as needed!